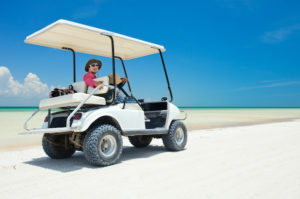 If you’ve already purchased a golf cart for your silver-haired years (or your hair follicle-challenged years) then chances are you are not willing to give up your sense of adventure and your love of staying active. Obviously, you didn’t buy that golf cart just to park it in your driveway. And, needless to say, staying active helps you live a full life even if you have to cross out “tackle football” or “mountain climbing” and replace them with safer options. But that golf cart can certainly help you do more than make trips to your hair stylist or the dentist’s office. For those who have recently purchased their first golf cart might not yet realize the many options for staying active in a retirement community or whatever style neighborhood in which you reside. The first thing you will do with your golf cart is take it for a spin. Yes, this is very different than taking a shiny new Corvette out on some back road to see if you can open her up a bit and “see what this baby can do.” The top end speed for a golf cart will fluff up your hair, but the wind you feel will mostly be the wind that’s blowing through town, anyway, undiminished at a stop light. The point here is that golf carts are flat-out fun things to own. If the sun is shining, take it out for a ride, air it out a little bit. At 20 to 25 mph, the world looks quite a bit different. It isn’t a blur, but it isn’t stagnant, either. It’s a peaceful ride that allows you to take in your surroundings in a different light. Riding through your local neighborhood allows for a heavy intake of fresh air and appreciation for your neighborhood. A golf cart rolls around at the speed of a burro that’s in a hurry, except in a fashion that is a lot more comfortable. Sightseeing is certainly an option, all the better if you live someplace where the paved road meets up with Mother Nature. You may not be able to make that hike to the trail head as you did in the past, but the golf cart can get you right to the edge, saving your energy for a nice walk in the woods. Try a picnic outing. Your golf cart has a luggage rack for a reason and there isn’t much that’s as romantic, nostalgic and casual as a picnic lunch or diner in a scenic setting. Imagine, a beautiful day to enjoy a picnic without the hassle of walking a significant distance to get there. Remember, a picnic outing for seniors doesn’t mean you have to go with Kool-Aid and baloney sandwiches. Stop at the local specialized grocery store and fill up with some exotic options: pate de foie gras, some brie cheese, a special desert and fine wine. If you’re driving past or to the old mill stream, don’t forget your fishing gear. Take advantage of that wealth of knowledge you’ve tucked away over the years and put it to good use – one way of saying, you know how to catch fish, what are you waiting for? Invent a golf cart safari. There are many parks with roads running through them or around them and you can take advantage of the calming presence of a golf cart and quietly approach wildlife – especially if you have a quiet electric motor. However, be sure to be careful when you go on this adventure. You can’t roll up your windows if a bear gets too curious about what you are doing in its territory. Better keep the safari option open for herbivores only. To be safe though, be sure to check on the state and federal laws that apply to driving a golf cart in your community. Golf cart races are certainly out of the question, but you can mimic an adventure activity that motorcycle enthusiasts enjoy, which is a so-called “Poker Run”. This involves mapping out a route that a large group of travelers would all use and having the participants pick up a card at each stop along the way, so when they return home they have five or ten cards in their procession that they would use as their poker hand – or whatsoever game suits your fancy. This would be loads of fun for community engagement! Often this is done to cover some miles on motorcycles and typically the stopping points include a few saloons or possibly a local wine tour. But alcohol doesn’t have to be the incentive here. People also plan “Poker Run” days for charity and figure out how to get participants to donate funds through entry fees or other, creative and fun options. You might organize a day in which friends all chip in to bet, essentially, on who can log the most miles in a day with their golf cart. At the end of the day, you might host a diner in which each participant stands up and tells the friends what kind of adventure they got into or what they saw on their ride. You could do this and set a cap on mileage – say a five- or ten-mile maximum. Then you might have several winners, but it would still be fun for everyone. You could also organize a treasure hunt. During a vacation to a seaside location years ago, I wrote out clues in rhyming couplets and with four or five cars participating they drove from location to location, where I had planted more clues. At each stop they found a letter, which eventually spelled out the word lobster. Guess what we had for dinner that night? Many towns and villages across the country host an annual festival – the Dairy Days (in early June) in my neck of the woods – so don’t forget to sign up a golf cart platoon to represent the local residential community where you live. Remember, all politics are local and some day some issue will come up on the town or village board that has to do with your community. So waving at the crowd from your golf cart during the local parade – with a banner proudly announcing who you are – is always a good PR gesture that might have a pay off someday. The penultimate suggestion here is to offer your golf cart for an Uber-type taxi service for someone in your community who may not have one and can’t get to stores or local concerts or festivals. Give back to those through a generous ride through the blissful, peaceful air that fills a golf cart. In its heart of hearts, a golf cart is a resource. Maybe your neighbor has trouble getting to the grocery store now and again, especially during holidays when public transport ion cuts back, as it does in some communities, to a minimum of runs. Doing someone a good turn will feel good, as any volunteer service does. The last suggestion – don’t say you didn’t see this coming – is go out and play some golf. That was their original intent for being invented, however, retirement communities offer you the ability to slow down life and smell the roses. A golf cart is a perfect way to accompany your lifestyle in the retirement years. We have three players in their nineties in the senior league that I play in. So, there’s no excuses. Go out and enjoy a day in the sun. And, if you want, don’t keep score. That works, too.